I got some wonderful stuff over the weekend, and my policy has always been to use new things at the first opportunity. 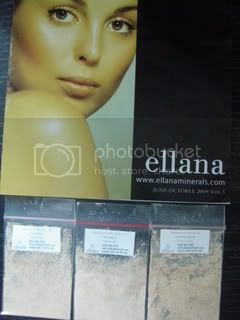 First things first: the Ellana Minerals samples! After moisturizing my face with Olay Total Effects cream, I brushed on a teensy amount of Caramel Latte foundation all over my face — it really does go a long way! I dabbed on some Elianto concealer under my eyes, then matte-fied my entire face with the Espresso con Panna finishing powder. Just to add some color back, I used some beige eyeshadow (two tones) from Clinique, then dusted Nichido Cool Rum and Passionate Red blushes onto my cheekbones. Strawberry lip balm from Nivea finished this barely-there look. The makeup had to be light because I was stepping out in a sundress I’d bought on sale at Jellybean the previous day. (From 799 pesos, the dress price had been slashed down to 400 pesos Ü) I wore a bandeau bra to conceal some assets, then used the Clinique loot bag I’d picked up from the makeup event two months ago as a handbag. My trusty gold Havaianas completed the laid-back look.